Carinthia Jane "Kinta" Beevor, née Waterfield, was a daughter of Aubrey Waterfield, a painter, and his wife Lina Waterfield, a journalist and founder of the British Institute in Florence. The famous women writers of the family included Lina's paternal aunt and guardian Janet Ross, and her grandmother Lucie, Lady Duff Gordon, a friend of Thackeray, Dickens and the Carlyles. Kinta's father fell in love with La Fortezza della Brunella, a Renaissance-era fortified property in northern Tuscany that he first saw in 1896, and he brought his bride there on their honeymoon in 1903. The Waterfields leased, and later bought and restored it. Kinta saw it first as a child in 1916 and revelled in its deep walls and extraordinary roof-garden. She lived there for five years before being sent to an English boarding school for her education. In 1933, Kinta married Jack Beevor, a solicitor, with whom she had three sons, and Italy became their vacation place. 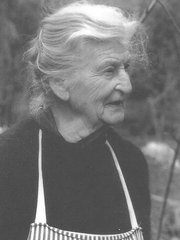 Kinta Beevor's memoir A Tuscan Childhood (1993), her first and only book, tells of the family's slow retreat from Tuscany, the attempts to make ends meet, then the sale of La Fortezza in the 1980s. Her son Antony Beevor became a bestselling writer and military historian. Kinta Beevor is currently considered a "single author." If one or more works are by a distinct, homonymous authors, go ahead and split the author. Kinta Beevor is composed of 1 name.